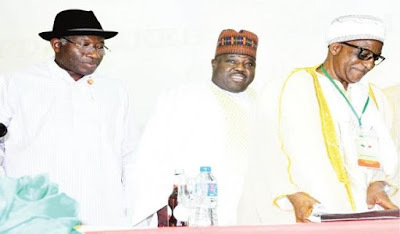 The national chairman of the Peoples Democratic Party (PDP)‎, Senator Ali Modu Sheriff, yesterday stormed out of a meeting called by former President Goodluck Jonathan to unite the fictionalized party. Yesterday’s meeting was the first gathering at which the two factions and nearly all the party bigwigs sat under one roof in nearly a year. However, trouble erupted even before the real business of the day began. Sheriff who arrived at about 3:10 pm when Jonathan had just ended his opening remarks, sought to preside over the meeting based on a recent appeal court ruling that handed over the party to him as its authentic chairman. He also asked to be allowed to make an opening remark but both requests were turned down. It was at this stage that Sheriff walked out with some members of his National Working Committee (NWC) in tow. Speaking with newsmen shortly before he left the venue, the former Borno state governor said he was shocked at being denied the opportunity to preside over the meeting. "The party as at today has one national chairman, which is Ali Modu Sheriff. There is no PDP meeting that will take place under any arrangement that I will not make an opening remark as national chairman‎. "I think Governor Dickson made a proposal and we have accepted it. Other people have a programme to bring an agenda which is not part of the proposal. And as a national chairman of the party, I told you people in my office that I will not be party to anybody using me to do another programme; I will not be," he said. When asked if he has respect for the former president who convened the meeting, Sheriff said, "I have respected him by flying from abroad to attend the meeting.‎"
He added, "We have a programme, which is initiated by Dickson, anything outside that, I will not be part of it." The meeting continued after Sheriff departed. Briefing newsmen at the end of the meeting, Jonathan said nothing would stop the party from getting out of the crisis and regaining power in 2019. He announced that a committee to be chaired by himself, former Vice President, ‎ Namadi Sambo or former senate president, David Mark would be constituted to propose a roadmap out of the crisis in two weeks time. He said the committee would have members drawn from ‎the Board of Trustees (BoT), National Assembly Caucus, PDP governors, former ministers and youths and the women leaders. During the opening session, the former president appealed to the two gladiators to make sacrifices by shelving their 2019 ambition and working as one united family. He said the PDP is a leading light in constitutional democracy, stressing that the stakeholders should not allow the party to continue to drift. "We have to remind ourselves that the prolongation of the crisis in our party may have cost us so much in election fortunes, in recent time. The loss of Edo and Ondo gubernatorial elections is still fresh in our memory. It goes without saying that we cannot afford to have a repeat of that in the forthcoming elections in Anambra, Ekiti and Osun States. "It is high time we buried the hatchet, suppressed our ego and prepared to make sacrifices in the interest of our party and, indeed the country. "Our ambitions therefore must come second; otherwise, we will only be building castles on quick sand. We must realize that as they say, everybody is nobody without a platform. So, why destroy the platform? "As politicians, with the zeal to lead our people, we must aspire to higher offices or identify the people we believe have leadership qualities and encourage them to aspire to those positions. "But one thing is very clear: You cannot, as the polity is configured today, be elected into a higher office on the platform of a weak party. "There is no doubt that the PDP will emerge from this moment of trial to regain its position as the greatest party on our continent.‎ This meeting of today is therefore designed to stem the drift," the former president said. Jonathan added that a smaller committee of not more than 40 members would be constituted to fine tune the suggestions of the larger body, to finally resolve all the outstanding issues. "In closing, I charge our great party leaders to make personal and general sacrifices to ensure the quick resolution of the problems in our party. The PDP is a symbol of democracy. If you believe in the PDP, there is no sacrifice too big for you to make," he said. ‎A chieftain of the party from the north who was part of the meeting and spoke with Daily Trust on condition of anonymity said‎: "Sheriff is the only one thwarting the PDP from re-organising and reclaiming power in 2019. I think he has a hidden agenda." He explained that Sheriff insisted on presiding over the meeting and giving an opening remarks in the capacity of PDP national chairman. According to him, Sheriff insisted that Makarfi must not speak at the meeting but while stakeholders prevailed on him to sit down as both of them (Sheriff and Makarfi) were not allowed to speak, he staged a walk out. Jonathan arrived Yar'adua Centre, Abuja, venue of the meeting, in company of the factional PDP chairman, Senator Ahmed Makarfi; deputy senate president, Ike Ekweremadu; Governor Ayodele Fayose of Ekiti State and Sheriff's deputy, Dr Cairo Ojougboh. Party leaders at the meeting were Governor of Ekiti State and chairman of the PDP Governors' Forum, Ayodele Fayose; Governor of Rivers State, Nyesom Wike; former governor of Kano State, Malam Ibrahim Shekarau; former minister of aviation, Chief Femi Fani-Kayode; former minister of special duties, Alhaji Kabiru Tanimu Turaki; chairman of the party's Board of Trustees (BoT), Senator Walid Jibrin, former Senate President Anyim Pius Anyim and former political adviser to President Jonathan, Ahmed Rufai Alkali. ‎Others were Governor Darius Ishaku of Taraba State; former senate president, Adolphus Wabara; current deputy Senate president, Ike Ekweremadu, senate minority leader and former governor of Akwa Ibom State, Godswill Akpabio; BoT member, Chief Tom Ikimi; Senator Ibrahim Kazaure; former deputy speaker of the House of Representatives, Emeka Ihedioha; former governor of Plateau State Jonah Jang; former national publicity secretary of the party, Chief Olisa Metuh and former acting national chairman, Prince Uche Secondus. ‎Governor Hassan Dankwambo of Gombe State and his counterpart in Ebonyi State, Dave Umahi, were represented by their deputies‎.